THERE HAVE BEEN tributes paid to the late poet Seamus Heaney who died today, aged 74. 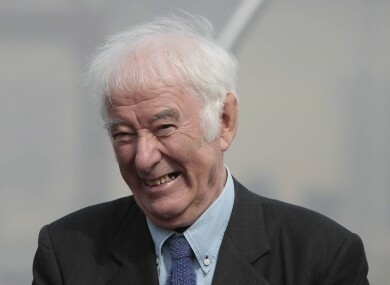 Heaney, a Nobel laureate, was one of Ireland’s and indeed the world’s best known poets and had been suffering from ill health in recent weeks. President Michael D Higgins has led tributes today speaking of Heaney’s “immense” contribution to “the republics of letters, conscience and humanity”. The President, himself a poet, continued: “As tributes flow in from around the world, as people recall the extraordinary occasions of the readings and the lectures, we in Ireland will once again get a sense of the depth and range of the contribution of Seamus Heaney to our contemporary world, but what those of us who have had the privilege of his friendship and presence will miss is the extraordinary depth and warmth of his personality. Long before his being awarded the Nobel Prize for Literature which Sabina and I, and the late Davy Hammond attended with him as his guests, we were aware of his grace and his generosity. His careful delving, translation and attention to the work of other poets in different languages and often in conditions of unfreedom, meant that he provided them with an audience of a global kind. And we in Ireland gained from his scholarship and the breath of his reference. Generations of Irish people will have been familiar with Seamus’ poems. Scholars all over the world will have gained from the depth of the critical essays, and so many rights organisations will want to thank him for all the solidarity he gave to the struggles within the republic of conscience. Tánaiste Eamon Gilmore said that “we have lost a great Irish poet and a great Irishman”. Speaking on RTÉ’s Today show this morning, the Arts and Heritage Minister Jimmy Deenihan paid tribute to the poet, saying that his work had gone all over the world, noting that he had recently been in Paris with him where he performed to a “huge audience”. Press Ombudsman and friend, John Horgan, told the same programme that Heaney was “a great listener, a great talker and a great reader” and said that as a friend of many decades he “gave far more than he ever received”. His Sinn Féin colleague and party president Gerry Adams said: “I knew and was very fond of Seamus. Fianna Fáil leader Micheál Martin said that Heaney “was a giant of modern literature”. Email “'Full of humour, care and courtesy': President leads tributes to Seamus Heaney ”. Feedback on “'Full of humour, care and courtesy': President leads tributes to Seamus Heaney ”.